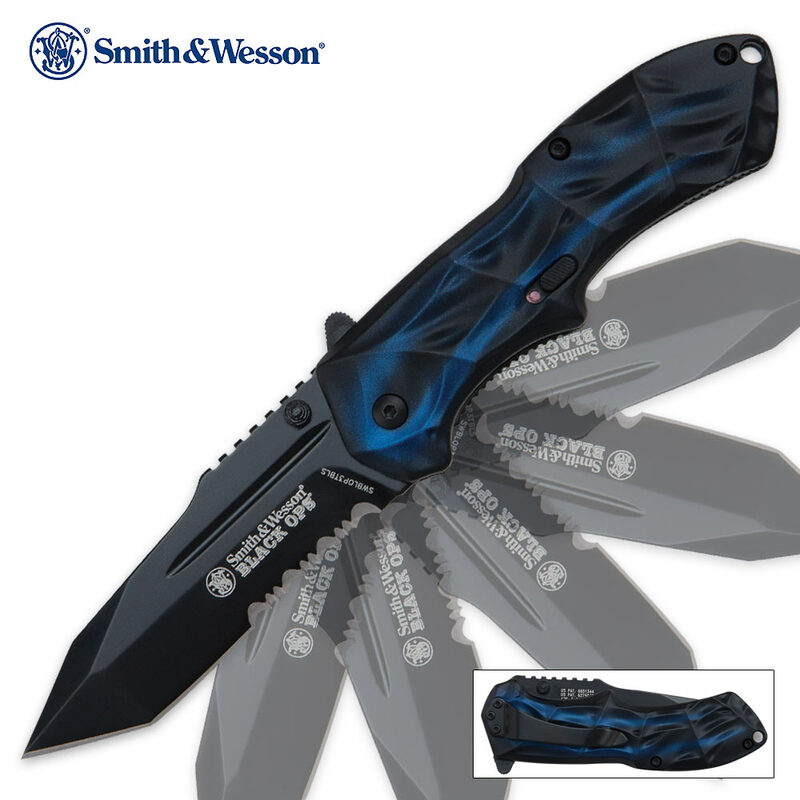 Smith & Wesson Black Ops Assisted Opening Pocket Knife Blue Tanto | BUDK.com - Knives & Swords At The Lowest Prices! 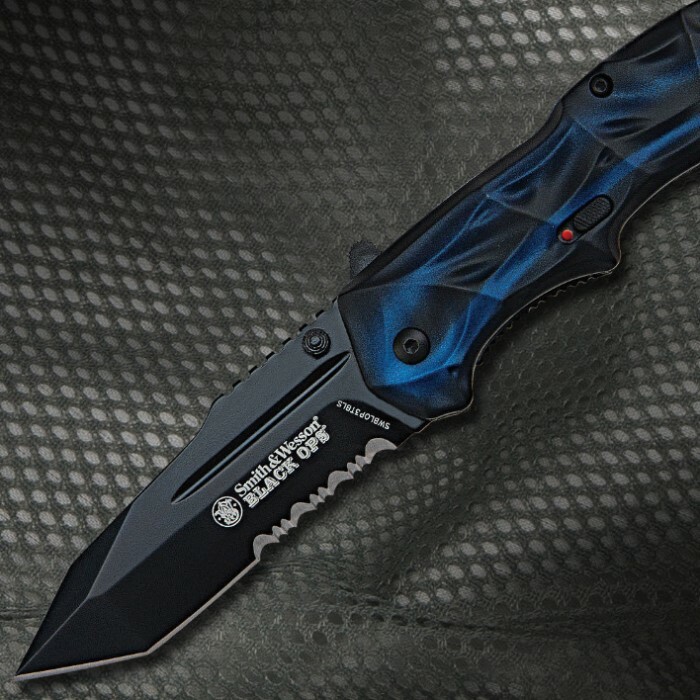 This Smith & Wesson Black Ops assisted-open pocket knife offers a unique, ergonomic handle pattern constructed of impact-resistant aluminum, this time in a handsome blue color. The razor-sharp serrated 4034 stainless steel blade is teflon coated and features the M.A.G.I.C. assisted-open mechanism that can be activated by the ambidextrous thumb stud or the finger actuator on the back of the blade. I missed this knife! Had one before and miss placed it and never found. Great knife to have! 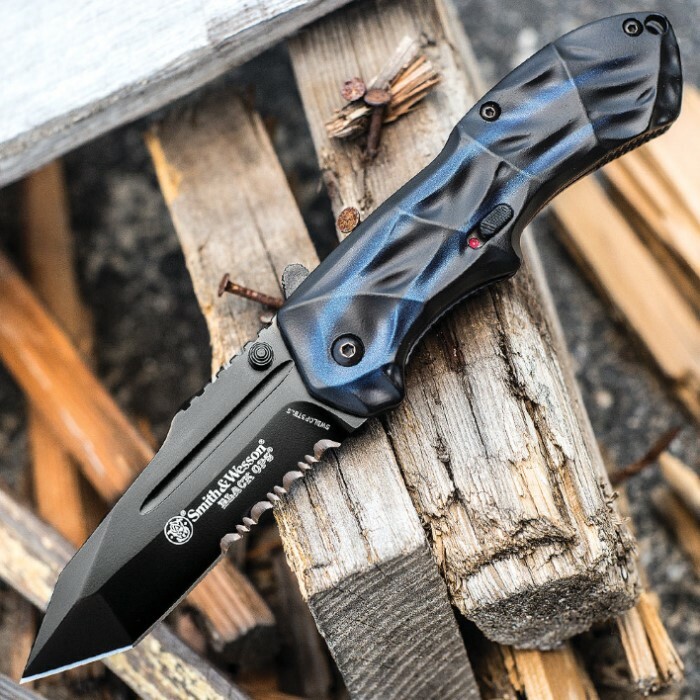 Great long lasting pocket knife!!! Lasting up about 2-1 years till present. AWESOME KNIFE!!! its worth it!! I bought four of these assisted opening knives for Christmas gifts and everyone loved them. Awesome look and function. I cannot wait to receive this masterpiece. Based on the reviews, I think it's going to turn out pretty bada**. This is pretty much my favorite knife. The assisted opening mechanism is flawless, it looks real cool, and it comes with an edge that has been able to cut anything I throw at it. If you want a knife you can show off and also have it work well, this should definitely go on your list. A great knife. Sharp enough out of the box to not require time invested there. Instant deploy with little felt "recoil". The need for locktight has even been eliminated. I just got my knife today. It is super sharp and a great looking knife. The only problem is that the finger actuator on the back of the blade was broke out of the box. Its a great knife, but I got unlucky an received the broken one. I just received my knife in the mail and I am very happy with it. Great knife. Looks great, very sharp, and solid construction. I'm a Chef so I appreciate a fine blade. I definitely suggest getting this one. I will definitely buy many more products from BUDK! Awesome knife I completely recommend it.